My criteria for an ideal hotel is a place with delightful decor, a great pool, and good food. Here are some Palm Springs favorites that fit the bill on all accounts. You'll find color around every corner, affordable prices, and a great restaurant off the lobby that's perfect for fans of tequila and cactus. I would venture to guess you might want to ask for a room that isn't facing the pool if you prefer peace and quiet. Jonathan Adler designs exploded in here, in the best possible way. It's basically an adult playground, as seen in the famous photos by Gray Malin. Read more about it in this post. The restaurants on property are pricey but delicious. While it's only a stone's throw from downtown Palm Springs, you might feel more like you're in a European villa. The restaurant is the perfect place to enjoy aglass of wine with your honey. The collective of coffee shop, ice cream/gift shop, restaurant, and hotel on site are all amazing in their own way. I can always find the perfect gives in the ice cream shop, and The Reservoir restaurant is the perfect place to get in a game of bocce after a nice poolside lunch. The only downside I can find is that this is a couple of miles away from the heart of the action, but I was never more than a $10-15 Uber ride from other parts of town. There's a free "Buzz" bus that comes by the hotel, too! Otherwise it's great bang for the buck if you like a place with chic decor & friendly staff. Follow me on Instagram to catch scenes from my #WeekenderTravels. If you appreciate great interior design or love taking fun photos, prepare to be wowed around every corner. Jonathan Adler designed the guest rooms and the rest of the decor. 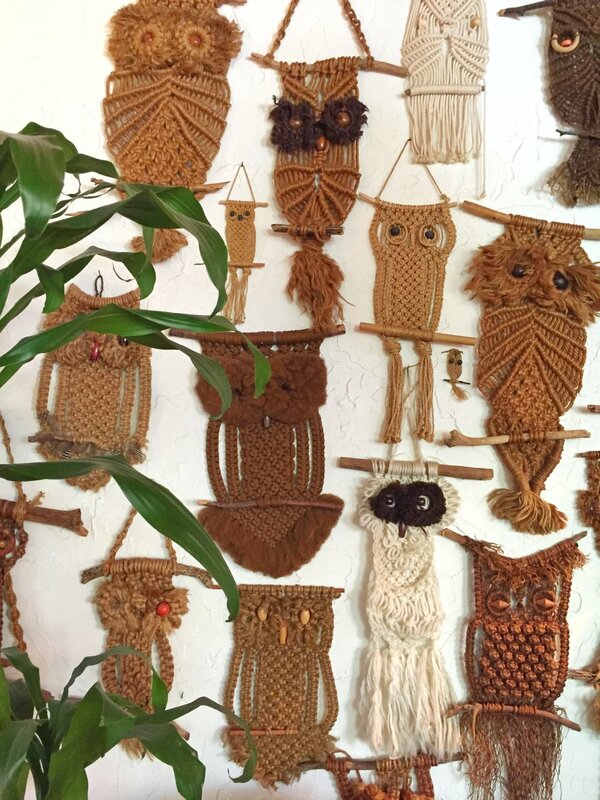 From a wall full of macrame owls straight out of the 70s to woven tapestry animals and knights guarding the bathrooms, you have got to see this place. I guess we can't give JA all of the credit... I think he had some help with the landscaping and architecture. Also, that wall lattice that guards the bright orange door? Yes please! There are hammocks and lounge areas all over the property along with two fun and fabulous pools. I haven't been this shut down on vacation ever, and we even spotted David Spade catching some R & R in a cabana. My only regret was not playing enough games while we were there. I was just dying to learn Petanque, whatever that is! They also had croquet and giant chess, which makes my heart happy. Grab a beverage at the Lemonade Stand and have a leisurely game with your boo! The moral of this blog post is that Palm Springs is always a good idea, and so is a splurge to this hotel. We went in October, and I would sign up for their email list so you can catch their killer specials in Dec/Jan and also when it gets really hot in the summer.